Live techno beamed directly to your ears from outer space by Vinz Exe, with dj sets from Stina Francina and future:remnants. Citizen is back in its spiritual home, Maze for another installment of forward thinking electronic music from around the world. 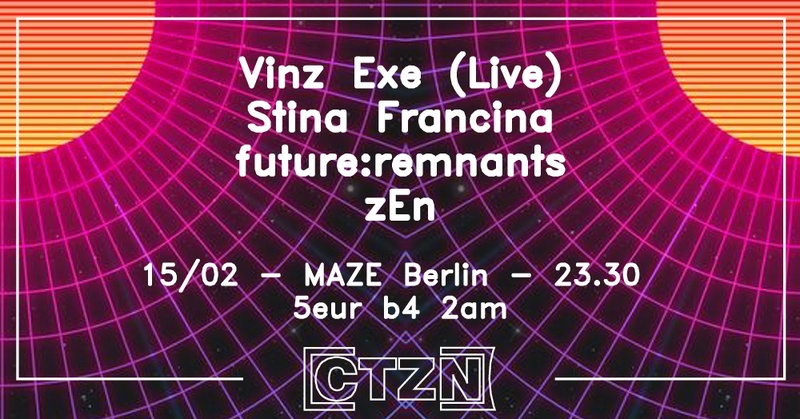 This time Citizen residents future:remnants and Stina Francina are joined by Italian Space Techno legend Vinz Exe. A former member of the free-party underground collective “Nameless Soundsystem”, Vinz has played all over Europe including nights throughout Italy, Germany and Poland. He is a versatile artist who explores various musical genres, in its tracks you can hear a variety of influences that make his sound. A powerful live performer, you can hear elements of techno, drone and ambient in his tracks, Vinz descibes his sound as “environmental techno”. Vinz has released on Arts, Warok, Circular Limited, Voight, Flash and Planet Rhythm and features on the upcoming compilation Techno Pressure 3 from Clubbers Culture due for release in January 2019. Returning to grace the decks at Maze after an outstanding performance in December Citizen is very happy to welcome StinaFrancina back. She shook the dancefloor at Maze in December and since then has played Eclectique and Techno Mittwoch in Berlin as well as shows in her home town of Gothenburg, Munich and Vienna. Emotional, energetic and hypnotic – Stina’s DJ sets are anything but predictable. Citing Bloody Mary, Johanna Knutsson and Nur Jaber, as just some of her influences, as well as 90’s acid techno and IDM. Stina’s tracks can be described as fast and thumping left-field techno with a cheeky attitude. Stina loves to play the last set of the night and is known for keeping people dancing long after closing time. Her debut EP “Ways to stray” is scheduled for release in Winter 2018/19. future:remnants made his Berlin debut at the last Maze and it went down so well we thought he should probably play again! Berlin based future:remnants makes emotional, dark techno inspired by the urban cityscapes of Berlin and London. Originally from Wolverhampton by way of London and New York, his influences start at the UK Industrial and EBM scenes of the late nineties and early 2000s, with bands like Nine Inch Nails, Icon of Coil and Frontline Assembly leaving their mark on his sound. More recently future:remnants’ tracks have been shaped and nurtured by the European and Detroit Techno scenes, with the records of Acronym, Isaac Reuben, David August, Max Cooper Richie Hawtin, Scuba and Carl Craig all leaving their own impressions. Lo-fi analogue glitch and haunting melodies sit alongside driving techno rhythms to create something that should satisfy the most avid raver or beard stroking IDM fan. future:remnants’music moves seamlessly between deep and melodic, and raw, hard, danceable jams.